Bishoprick at Durham, and at Newcastle. Gateside to Newcastle upon Tyne. Exp. HODIE 1a vice lecta est Billa, to avoid the Excess of Wines. Eodem die, 3a vice lecta est Billa, for the new Erection of a Bishoprick at Durham, and also one other at Newcastell, que communi omnium Procerum Assensu, conclusa est, et missa in Domum Communem per Magistrum Brook, Servientem ad Legem, et Ricardum Reede, Militem. Eodem die, 2a vice lecta est Billa, for the true answering of the King's Majesty's Revenues. 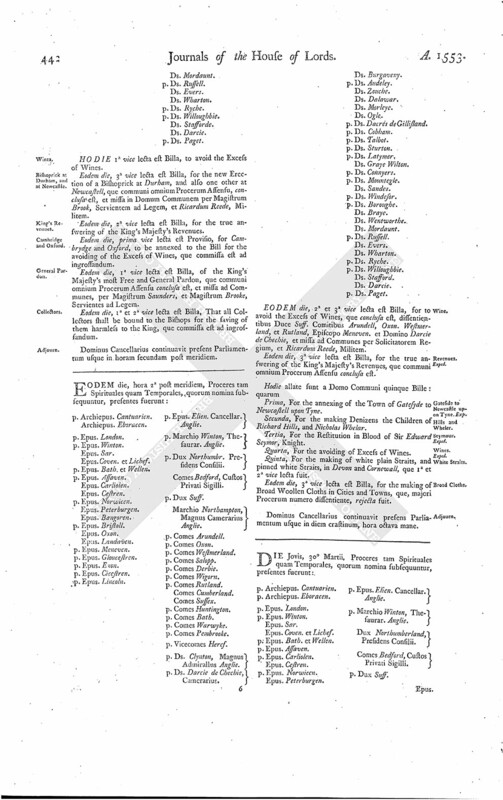 Eodem die, prima vice lecta est Provisio, for Cambrydge and Oxford, to be annexed to the Bill for the avoiding of the Excess of Wines, que commissa est ad ingrossandum. Eodem die, 1a vice lecta est Billa, of the King's Majesty's most Free and General Pardon, que communi omnium Procerum Assensu conclusa est, et missa ad Communes, per Magistrum Saunders, et Magistrum Brooke, Servientes ad Legem. 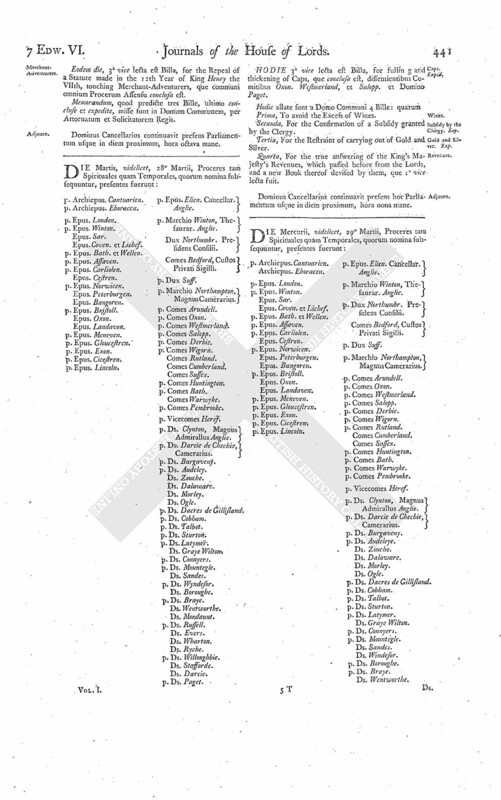 Eodem die, 1a et 2a vice lecta est Billa, That all Collectors shall be bound to the Bishops for the saving of them harmless to the King, que commissa est ad ingrossandum. Dominus Cancellarius continuavit presens Parliamentum usque in horam secundam post meridiem. Marchio Northampton, Magnus Camerarius Anglie. EODEM die, 2a et 3a vice lecta est Billa, for to avoid the Excess of Wines, que conclusa est, dissentientibus Duce Suff. Comitibus Arundell, Oxon. Westmerland, et Rutland, Episcopo Meneven. et Domino Darcie de Chechie, et missa ad Communes per Solicitatorem Regium, et Ricardum Reede, Militem. Eodem die, 3a vice lecta est Billa, for the true answering of the King's Majesty's Revenues, que communi omnium Procerum Assensu conclusa est. Prima, For the annexing of the Town of Gatesyde to Newcastell upon Tyne. Secunda, For the making Denizens the Children of Richard Hills, and Nicholas Whelar. Tertia, For the Restitution in Blood of Sir Edward Seymor, Knight. Quarta, For the avoiding of Excess of Wines. Quinta, For the making of white plain Straits, and pinned white Straits, in Devon and Cornewall, que 1a et 2a vice lecta fuit. Eodem die, 3a vice lecta est Billa, for the making of Broad Woollen Cloths in Cities and Towns, que, majori Procerum numero dissentiente, rejecta fuit.